english name "Euro-Asian Death Cap"
1. Amanita phalloides, pine plantation, Cape May Co., New Jersey, U.S.A.
2. Amanita phalloides, pine plantation, Cape May Co., New Jersey, U.S.A.
3. Amanita phalloides, pine plantation, Cape May Co., New Jersey, U.S.A.
4. Amanita phalloides, pine plantation, Cape May Co., New Jersey, U.S.A.
5. Amanita phalloides, Roosevelt, Monmouth Co., New Jersey, U.S.A. (RET 520-1). 6. Amanita phalloides, Roosevelt, Monmouth Co., New Jersey, U.S.A. (RET 520-1). 7. Amanita phalloides, Roosevelt, Monmouth Co., New Jersey, U.S.A. (RET 520-1). 8. Amanita phalloides, Roosevelt, Monmouth Co., New Jersey, U.S.A. (RET 520-1). 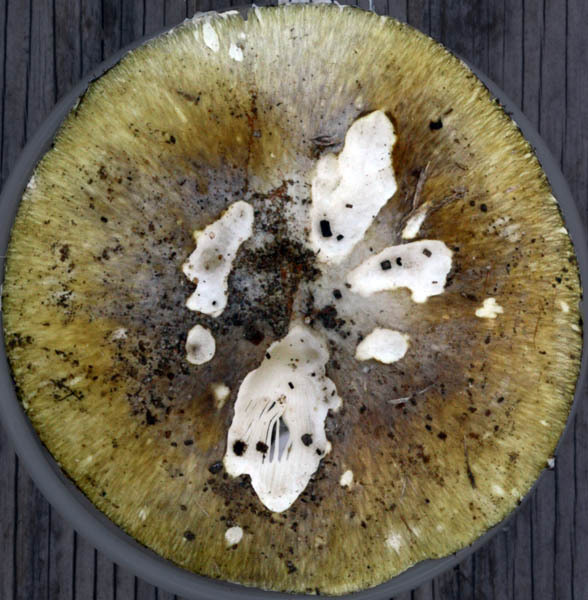 cap The cap of Amanita phalloides is (40±) 65 - 152 (-300±) mm wide, with pigment arranged in narrow bands of variously colored spots giving the illusion of multicolored radially arranged imbedded fibers. Among the colors involved are pale to dark variance of olive-green, yellow green to yellow, gray, and brown. Often described as dark fibers on a greenish or yellowish ground color; however, this is an optical illusion. Sometimes the center of the cap may be entirely of the darkest tints while sometimes the center of the cap may appear bleached. The cap is often palest at the margin (for example white or extremely pale yellow or extremely pale yellow green). The cap is subovoid to hemispheric with incurved margin at first, becoming convex, eventually subplanar with decurved margin, smooth, wet and sticky when moist, shiny when dry, sometimes faintly pruinose particularly over the center, with a nonstriate and nonappendiculate margin. The volva is absent or occasionally present as membranous patch, white to sordid white to pale beige. The flesh is white except for a yellow line below the cap skin, however the yellow tint disappears with age, with such a line disappearing in age, unchanging when cut or bruised, 4.5- - 7.5+ mm thick over the stem, thinning evenly to margin. gills The gills are free to narrowly adnate, crowded, white to cream in mass, white to cream to faintly pinkish cream to sordid cream to cream with slight yellow-greenish tinge in side view, unchanging when cut or bruised, 6 - 9 mm broad, with or without decurrent line on stipe apex. 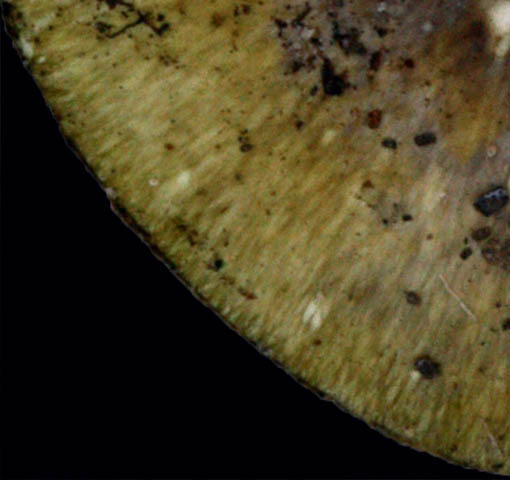 The short gills are truncate to excavate truncate to subtruncate, unevenly distributed, of diverse lengths, common, and occasionally arising at the stem as well as at the cap margin. stem The stem is (35±) 54+ - 135 (-300±) × 8 - 17.5 (-20+) mm, largely white to pale yellow below the ring, sometimes more strongly yellow near the stem base, sometimes with faint yellowish white areas above the ring, narrowing upward, slightly flaring at the top in age, decorated with fine raised concolorous fibrils that darken from handling sometimes forming the "flame" pattern especially in the lowest third of stem. The bulb is 20 - 35+ × 16 - 50 mm, globose to subglobose, sometimes slightly compressed vertically, white, and very soft. 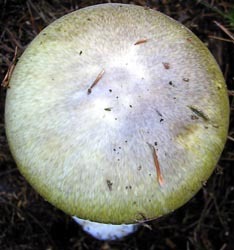 The ring is in the upper part of the stem, membranous, up to 30± mm from the stem to its edge, white to pale yellow with fine radial striations on the upper side, somewhat felted and ranging from white to containing one or more of the cap colors (which may be in irregular patterns) on the under side. The limbate volva is white on outer surface, white to yellow or with other tints from the cap (sometimes similarly unevenly pigmented) on the inner surface, membranous, persistent, opening somewhat irregularly, with top of limb up 26- - 65 mm from the base of the bulb, with the limb more or less the same height as the bulb vertical thickness. odor/taste In age, the odor of this mushroom is distinctively repugnant and can be detected at a distance. It is various described as "sickeningly sweet," "like rotten honey," "like carrion," etc. This species is deadly POISONOUS. spores The spores measure (7.5-) 8.0 - 10.1 (-13.5) × (5.5-) 6.1 - 8.0 (-10.5) µm and are subglobose to broadly ellipsoid to ellipsoid and amyloid. Clamps are not found at bases of basidia. 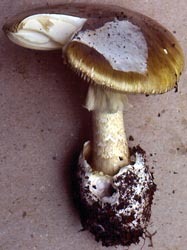 Amanita phalloides was originally described from Europe. In Europe in occurs with beech (Fagus), oak (Quercus), pine (Pinus), chestnut (Castanea), horse chestnut (Aesculus), birch (Betula), filbert and hazelnuts (Corylus maxima), iron wood or hornbeam (Carpinus), and spruce (Picea). In the northern hemisphere the present species when transplanted can spread to local trees of the same genera in addition to Canadian hemlock (Tsuga). It is reported under Leptospermum in New Zealand and under Eucalyptus and leguminous trees in Tanzania. Importation in the western hemisphere has occurred from Canada to Argentina. This species is easily exported with its symbionts (oaks, pines, nut trees, etc.). As a consequence, it has been introduced in many countries in which European trees of its symbionts have been planted. It can then be exported from those countries it has colonized. It would appear that it and A. muscaria (L. : Fr.) Lam. subsp. 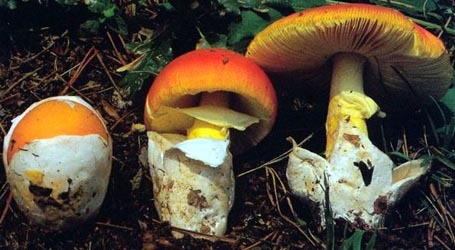 muscaria have been the most commonly exported species of Amanita. Everywhere it has been imported, it is a major cause of life-threatening mushroom poisonings. See also, A. arocheae Tulloss, Ovrebo & Halling, A. fuliginea Hongo, A. marmorata Cleland & E.-J. Gilbert, and A. subjunquillea S. Imai. The reader may want to examine the recently revised key to the taxa of sect. Phalloideae in North America. ≡Amanitina phalloides (Fr. : Fr.) E.-J. Gilbert. 1940. Iconogr. Mycol. (Milan) 27, suppl. (1): 78, tab. 30 (fig. 3). ≡Venenarius phalloides (Fr. : Fr.) Murrill. 1912 Mycologia 4: 240. ≡Agaricus bulbosus Bull. p.p. 1780-1781. Herb. France 1: pl. 2. GQ221841 nrITS 10.x.1993 Susan Hopkins s.n. (RET 118-6) B. Wolfe et al. (2010) Pringle Lab., Harvard Univ. GQ221831 nrITS 15.x.1998 Dr. Lawrence Leonard s.n. (RET 287-10) B. Wolfe et al. (2010) Pringle Lab., Harvard Univ. GQ221833 nrITS 10.x.1995 L. T. Biechele s.n. (RET 158-9) B. Wolfe et al. (2010) Pringle Lab., Harvard Univ. GQ221842 nrITS mid.x.1993 Don Pasquale s.n. (RET 113-1) B. Wolfe et al. (2010) Pringle Lab., Harvard Univ. lectotypifications Neville and Poumarat. 2004. Fungi Europaei 9: 555.
selected illustrations Thiers. 1982. Agaricales Calif. I. Amanitaceae: pl. 35 (two photos). Phillips. 1981. Mushr. Fungi Great Britain Europe: 19. Moser and Jülich. 1989. Farbatlas Basidiomyc. 7: III Amanita 14 [top plate]. Breitenbach and Kränzlin. 1995. Fungi Switzerland 4: 153, fig. 154. Many references are made to the works of others in the following text. When the work of another researcher is not cited, then data is derived from original research of R. E. Tulloss. pileus (40±) 65 - 152 (-300+) mm wide, with ground color pale olive-green to yellowish green to yellow, usually appearing rather densely virgate with apparent radial fibrils grayish to brownish or umbrinous tinted compared to ground color (e.g., 1C3 or darker and/or browner), sometimes entire area over disc concolorous with such apparent fibrils, at 10× (lens) appearance of fibrils replaced by narrow radial bands of very variable color, often paler toward margin (pale yellow (e.g., ca. 1A2 with greenish tint to white), unchanging when cut or bruised, becoming tan to pale tan in age with palest coloration toward margin, subovoid to hemispheric with incurved margin at first, becoming convex with incurved margin, eventually subplanar with decruved margin, smooth, wet and sticky when moist, shiny when dry, sometimes faintly pruinose; context white, except for yellow line below pileipellis, with such line disappearing in age (remaining longest in disc), unchanging when cut or bruised, 4.5- - 7.5+ mm thick,, thinning evenly to margin; margin nonstriate, nonappendiculate; universal veil usually absent, occasionally as membranous patch, white to sordid white to pale beige. lamellae free to narrowly adnate, with or without decurrent line on stipe apex, crowded; white to cream in mass, white to cream to faintly pinkish cream to sordid cream to cream with slight yellow-greenish tinge in side view, unchanging when cut or bruised, 6 - 9 mm broad, broadest between mid-point of pileus radius and about last quarter of pileus radius; lamellulae truncate to excavate truncate to subtruncate, unevenly distributed, of diverse lengths, common, occasionally arising at stipe as well as at pileus margin. stipe (35±-) 54+ - 135 (-300±) × 8 - 17.5 (-20+) mm, largely white to pale yellow below partial veil and sometimes more strongly yellow near stipe base, sometimes with faint yellowish white areas above partial veil, narrowing upward, not flaring at apex when young, but slightly flaring at apex in age, decorated with fine raised concolorous fibrils that darken from handling, such fibrils sometimes forming “flame” pattern especially in lowest third of stipe; bulb 20 - 35+ × 16 - 50 mm, globose to subglobose, sometimes slightly compressed vertically, white, very soft; context white, unchanging when cut or bruised, firmly stuffed or sometimes hollow in part, with stuffing material comprising longitudinally oriented fibers, with larva tunnels concolorous, with central cylinder 4 - 10.5 mm wide; partial veil superior, membranous, up to 30± mm wide, above white to pale yellow with fine radial striations (10× lens), below somewhat felted (10× lens), ranging from white to concolorous with pileus including uneven pigmentation; universal veil as limbate volva, white on exterior, white to yellow to concolorous with pileus (and then soemtimes similarly unevenly pigmented) on inner surface, membranous, persistent, opening somewhat irregularly, with top of limb up 26- - 65 mm from base of bulb and about half of limb adnate to bulb, with no evident limbus internus at maturity. odor/taste Odor none or sickeningly sweet or with the nauseating sweetness of carrion or “sweet ester, cloying” (G. E. Davis s.n.) or like decaying honey (according to some European authors). Taste not recorded. tests Spot test for tyrosinase (L-tyrosine) - negative throughout basidiocarp except for very few small spots in pileipellis and on surface of lower stipe. 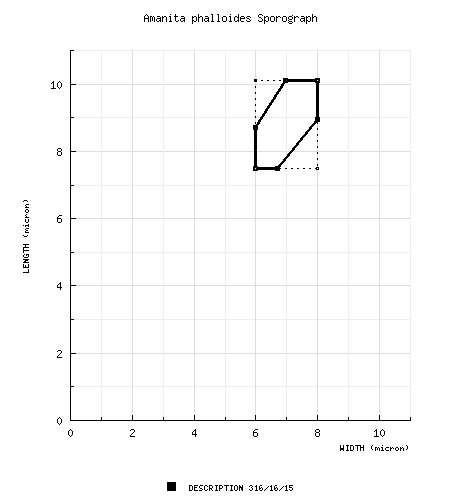 Spot test for laccase (syringaldazine) - negative throughout basidiocarp. Dilute H2SO4 - on pileus, slowy bleaching with addition of pale orangish tint. Test voucher collections: Tulloss 11-3-85-A1, -A2, -E, Tulloss 10-28-02-A. Results on California material according to Breckon (1968)—on exposed context of the lower stipe and bulb un-less otherwise noted: Concentrated H2SO4 - purple to lilac on lamellae; 3% KOH - negative; 15% KOH - negative to pale yellow; Melzer’s reagent - negative; phenol - negative; phenolaniline - negative; tincture of guaiac - negative. lamella trama bilateral; wcs = 35 - 40 µm (ca. moderate rehydration); ??. subhymenium wst-near = ?? µm; wst-far = ?? µm; having branching structure comprising uninflated and partially inflated and branched hyphal segments and small inflated cells (subglobose to pyriform to ellipsoid to narrowly ellipsoid), locally pseudoparenchymatous, with basidia arising from cells of all types. basidia 34 - 41 × 7.0 - 12.2 µm, dominantly 4-, infrequently 2-, rarely 1-sterigmate, with sterigmata up to 4.6 × 1.8 µm; clamps not observed. universal veil On pileus, exterior surface: t.b.d. On pileus, interior:t.b.d. On pileus, lower surface: t.b.d. On stipe base, exterior surface: t.b.d. On stipe base, interior: filamentous, undifferentiated hyphae 2.1 - 13.9 µm wide, dominating, commonly branching, with walls thin (occasionally) or up to 1.3 µm thick, with septa thickened when walls thickened, dominantly thick-walled, often sinuous or looping, interwoven moderately densely with some gaps, without discernible order, sometimes in fasciles, quite commonly single, occasionally with narrowly clavate to narrowly subventricose intercalary segment (e.g., 61 × 15.0 µm); inflated cells narrowly clavate to clavate, terminal, scattered, up to 92+ × 28± µm, with walls thin or thickened as in filamentous, undifferentiated hyphae; vascular hyphae not observed; clamps not observed. On stipe base, inner surface: t.b.d. stipe context longitudinally acrophysalidic; filamentous, undifferentiated hyphae ?? µm wide, ?? ; acrophysalides ?? × ?? µm, with walls up to 1.2 µm thick; vascular hyphae ?? µm wide, ??. composite of data from all material revised by RET: [316/16/15] (6.8-) 7.5 - 10.1 (-13.5) × (5.5-) 6.0 - 8.0 (-10.5) µm, (L = (7.7-) 8.3 - 9.5 µm; L’ = 8.8 µm; W = 6.4 - 7.3 (-7.4) µm; W’ = 7.0 µm; Q = (1.03-) 1.12 - 1.45 (-1.70); Q = 1.19 - 1.33 (-1.40); Q’ = 1.26), hyaline, colorless, thin-walled, smooth, amyloid, subglobose to broadly ellipsoid to ellipsoid, adaxially flattened, occasionally expanded at one end, occasionally lachrimiform, infrequently susceptible to crassospore formation and then crassospores dominant (seen in Argentine material only), sometimes as "giant" spores; apiculus sublateral, cylindric; contents granular or mono- to multiguttulate with or without small additional granules; white in deposit. ecology Solitary to scattered to subgregarious to gregarious to very abundant. Argentina: Under Quercus suber L. or under Pinus sp. British Columbia, Canada: Under introduced Fagus. France: Under Q. ilex L. Madagascar: Under introduced Pinus radiata D. Don. Netherlands: With Fagus sylvatica L. and Quercus spp. or in loam of a polder in a Carpinus plantation. Norway: In rich woods of Quercus, Tilia, and Ulmus. Switzerland: At 800 m elev. In mixed hardwood-conifer forest. In western North America: In the Pacific coastal region, the species occurs from at least as far south as Santa Cruz, California (Thiers 1982) to as far north as Vancouver Island. Delaware: (Tanghe and Simons 1973) in “abutting but essentially unmixed plantings” of Picea abies, Tsuga canadensis (L.) Carr, and P. strobus, but not in a nearby pure stand of P. resinosa Ait. New Jersey: In plantation of Pinus strobus L. in duff over sand or just outside of same plantation in similar soil in native, mixed woods including P. rigida Mill., Q. rubra L., Q. alba L., Acer rubrum L., Juniperus virginiana L., Ilex opaca Ait., Carya sp., Prunus pennsylvanica L., Liquidambar styraciflua L., Viburnum recognitum Fern., and Rhus radicans L. or under Picea abies or in mixed woods with Quercus spp. and F. grandifolia Ehrh. New York: With Pinus and Quercus in sandy soil of sparse, mixed woods or in park with Quercus dominating. Pennsylvania: Near Pinus in area landscaped with Quercus and Pinus planted in early 1970s. Virginia: apparently with native P. taeda L.
In addition to those states cited here and under “collections examined,” Jenkins (1986) lists Rhode Island. 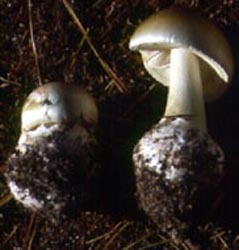 Trestrail (1992) reported a poisoning in Kentucky attributed to A. phalloides. Uruguay in association with introduced Quercus spp. [including both nonevergreen and evergreen species (“robles y encinas”) and, explicitly, with the cork oak, Q. suber (“alcornoques”)] and Pinus (Talice and MacKinnon, 1934). Ridley (1991) reports a single occurrence of association with native plants in New Zealand—regenerating forest of Leptospermum scoparium Forster & Forster f. and Kunzea ericoides (A. Rich.) J. Thompson. In identifying material from the region including Mexico, Central America, and Andean Colombia, a determination as the macroscopically similar A. arocheae Tulloss et al. (1992) should be considered first. The the latter taxon also should be considered in cases in which the mushrooms have been collected in association with Pinus or Quercus species having their natural range inclusive of the region extending from Mexico through Colombia. Similarly, in areas in which Australian trees have been imported (for example, in South Africa and in the Hawaiian Islands), a diagnosis of A. marmorata should be considered if a cursory observation has suggested A. phalloides. Extra-Eurasian material: ARGENTINA: BUENOS AIRES—La Plata, Parque de Facultad Agronomía, 1.viii.1968 Lindquist & J. E. Wright s.n. (BAFC 30.607), 22.iv.1970 Lindquist & J. E. Wright s.n. (BAFC); Parq. Pereyra Iraola, 21.iv.1985 poisoning victims s.n. (BAFC 30.443); public park, 23.v.1962 E. Horak 583 (ZT 12409); Tigre, v.1978 poisoning victim(s) s.n. (BAFC 30.608); 25 de Mayo, 25.v.1991 Hermann s.n. (BAFC 32.322). CANADA: BRITISH COLUMBIA—Vancouver Island, Victoria, Government House grounds, 24.x.1998 M. & J. Howe s.n. (DAVFP 25413). MADAGASCAR, REPUBLIC OF: ANALAMANGA REGION—Talatavolonondry [18°44’55.7” S/ 47°41’34.4” E], 17.ii.1997 Bart Buyck et al. 97.555a (in herb. Buyck => PC). U.S.A.: CALIFORNIA—Marin Co. - unkn. loc., 24.xi.1989 North Coast Foray 1989 participant s.n. [Tulloss 11-24-89-J] (RET 092-3). San Mateo Co. - Colma, cemetery, viii.1998 Michael Wood s.n. (RET 290-8). MAINE—Cumberland Co. - Falmouth, Mackworth Isl., 15.x.1998 Dr. Lawrence Leonard s.n. (RET 287-10, nrITS seq'd.). MARYLAND—Worcester Co. - Pocomoke River St. Pk., Shad Landing, 10.x.1995 L. T. Biechele s.n. (RET 158-9, nrITS seq'd.). MASSACHUSETTS—Barnstable Co. - ca. Eastham, 15.x.2009 Denise Boudreau s.n. (RET 457-1). NEW JERSEY—Atlantic Co. - Absecon, 20.x.2000 police in poisoning case s.n. (RET 320-2). Burlington Co. - Brendan T. Byrne St. For., Pakim Pond [39°52’49” N/ 74°32’02” W, 35 m], 23.x.2011 NJMA foray participant s.n. [Tulloss 10-23-11-D] (RET 504-6). Cape May Co. - Dennis Twp., Belleplain St. For., Dennisville, Jakes Landing Rd., ca. Dennis Crk. [39°11’22” N/ 74°51’12” W, 2 m], 29.x.1983 M. A. King, N. & A. MacDonald, & R. E. Tulloss 10-29-83-B (RET 209-6), -D (RET 208-10), -F (RET 209-3), -G (RET 209-7), 3.xi.1985 M. A. King & R. E. Tulloss 11-3-85-A1 (RET 131-10), -A2 (RET 131-7), -E (RET 131-8), 30.xi.1985 R. E. Tulloss 11-30-85-A (RET 130-9), 12.x.1997 P. E. Noell s.n (RET 272-1), 28.x.2002 R. E. Tulloss 10-28-02-A (RET 328-3), 8.xi.2015 Igor Safonov s.n. [11-8-15-E] (RET 715-1). Cumberland Co. - Union Lake, 17.viii.1984 Jill Lamoureux s.n. [RET 8-17-84-E] (RET 053-2, nrITS & nrLSU seq'd. ); Vineland, mid.x.1993 Don Pasquale s.n. (RET 113-1, nrITS seq'd.). Hunterdon Co. - Milford, Robt. Peabody prop., s.d. R. Peabody s.n. (RET 360-2). Monmouth Co. - Roosevelt, 12 S. Rochdale Ave. [40°12'52.3" N/ 74°28'33.8" W, 43 m], 20.x.2012 R. E. & M. A. Tulloss 10-20-12-A (RET 520-1), 27.x.2012 R. E. & M. A. Tulloss 10-27-12-A (RET 520-7). Morris Co. - Mendham, Meadowood Twp. Pk. [40°47'31" N/ 74°38'43" W, 214 m], 10.x.1993 Susan Hopkins s.n. (RET 118-6, nrITS seq'd.). Somerset Co. - Bernardsville, 21.x.1993 S. Hopkins s.n. (RET 118-7); Bernardsville, Rte. 202, 26.x.1995 Susan Hopkins s.n. (RET 159-6). NEW YORK—Dutchess Co. - Pawling, NW shore of Green Mountain Lk. [41°34’51” N/ 73°36’19” W, 148 m], 8.x.2012 Steve Rock s.n. (RET 518-4). Sussex Co. (Long Isl.) - Lakeland Co. Pk., 2.xi.1995 George E. Davis s.n. (RET 160-6). PENNSYLVANIA—Luzerne Co. - Wilkes-Barre, S Wilkes-Barre Blvd. [41.2406º N/ 75.8791º W], 26.ix.2011 D. Wasilewski s.n. [www.mushroomobserver.org #77398] (RET 499-10). WASHINGTON—Clark Co. - Vancouver, 130th block E. Evergreen Hwy., 19.x.1992 J. E. Lindgren 92-66 (RET 075-2), 92-67 (RET 074-8); Vancouver, E. Evergreen Hwy., 24.x.1988 J. E. Lindgren 133 (RET 044-1). Cai et al. (2014): U.S.A.: CALIFORNIA—Unkn. Co. - unkn. loc., s.d. unkn. coll. s.n. (HKAS 75773). discussion This taxon is widely known to contain amatoxins and a heat labile toxin known as phalloidin as well as related compounds; for example, see (Hatanaka, 1992). Recent research indicates that it does not contain the the non-protein, amino acid toxin present in A. smithiana (Apperley et al., 2013). citations Note: Also Tulloss G-B50 18.viii.1978 (RET) & Tulloss 10-29-83-A (RET). NOTE: See Shervanick 400 (SFSU). photo RET - (1-4), Cape May County, New Jersey, U.S.A.
(5-8), Roosevelt, Monmouth County, New Jersey, U.S.A.